The greenest way to lift the country out of a deepening recession is to put people to work building mass transit. There’s a lot of talk about the “green jobs” that will emerge through investment in cleaner technologies, but some of the greenest technology already exists. In fact, it predates the automobile: mass transit. Trains, trolleys and buses are a far more energy efficient way of moving people than cars. 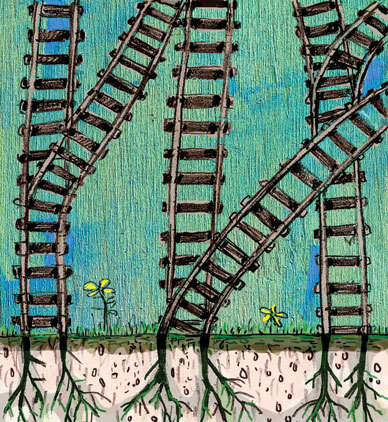 The greenest jobs of all may be laying track for suburban commuter rail or driving trains along those tracks. Investing in mass transit would benefit not just the environment but also poor people, many of whom can’t afford cars, don’t drive and so have been shut out of the new economy, with its service sector employment increasingly available only in suburban office parks. A study by the University of Wisconsin found that 74 percent of African-Americans and 66 percent of Hispanics ages 18 to 24 in Milwaukee County did not have a valid driver’s license. As urban theorists like Joel Rogers have noted in their “Emerald Cities” proposal, building mass transit could also strengthen labor, providing a larger base of unionized construction and maintenance jobs. The greenest way to lift the country out of a deepening recession would be to put people to work building mass-transit infrastructure, which could, in turn, ease the flow of goods and services, help generate economic growth and open economic opportunities to the disadvantaged. With a new president from Chicago and a House Speaker from San Francisco, the time seems ripe for Democrats to take advantage of the dual opportunities this year presents to alter America’s transportation infrastructure radically: the upcoming stimulus spending bill and the Surface Transportation Reauthorization, due for renewal by September. Obama sent more positive signs early in the transition process when he brought in a cadre of urban-policy veterans, from New York to Chicago to Washington. He also created the first-ever White House Office on Urban Policy. But Obama’s pick of Illinois Representative Ray LaHood as transportation secretary disappointed some transit advocates. The Obama transition team’s summary press release to reporters mentioned LaHood’s efforts to secure highway funds and expanded air service but made no mention of buses or trains. Anyone in Washington can tell you, off the record, that LaHood was simply the token Republican, chosen for his moderation, genial persona and relationship with Obama and Rahm Emanuel. While his voting record on transportation is good, for a Republican, he has never been outspoken or a leader on the issue. Nonetheless, smart growth and transportation activists still have high hopes that the Obama administration and a Democratic Congress will revitalize mass transit. But institutional stumbling blocks–including generations of federal policy favoring roads and cars; pressure from fiscal conservatives; and the power of auto, oil and highway construction lobbies–may cause them to miss this opportunity. Transportation accounts for 27 percent of America’s greenhouse gas emissions and 33 percent of carbon dioxide emissions, according to the Environmental Protection Agency. It’s not just because we drive gas guzzlers; it’s because we drive so much. Almost 90 percent of trips in the United States are made by private vehicle, compared with 58 percent in Britain. Even if average fuel efficiency increases to thirty-five miles per gallon by 2020, as mandated by law, the corresponding reduction in emissions could be easily wiped out by the increase in vehicle miles traveled. To reduce our contributions to climate change, we must also reduce our driving. Government regulations and spending priorities have favored driving as the means of moving people and products since the Eisenhower administration and the advent of the Interstate Highway System. More than 80 percent of transit money from gas taxes supports highways and bridges, with the remainder, less than 20 percent, allocated for mass transit. Moreover, federal contributions to highway projects often cover more than 80 percent of the total construction costs, compared with only 50 percent of the typical cost for a transit system. Rail freight, which uses one-third as much energy per mile as trucking to ship a pound of cargo, has no federal funding at all. There is no rail freight across the Hudson River into New York City; virtually all goods have to enter by truck. Anti-transit biases written into federal regulations make it much more difficult to obtain transit funding than to get highway funding. Under current rules, funding for a mass-transit system is only provided to areas that already have the density to support it. But mass transit works best when it is built in advance of creeping development, as it was in New York City, so that the tallest buildings can be built closest to the transit nodes, where the premium for housing or office and retail space is highest. It is a self-fulfilling prophecy: if you build highways, inefficient suburban sprawl will develop and, ultimately, so will traffic and the demand for yet more highways. Build mass transit and you see high-density, efficient housing construction and people living without cars. As the high demand for housing in walkable urban environments like Manhattan and San Francisco demonstrates (and as public opinion polls confirm), plenty of Americans want to live in dense urban communities, and their numbers will only grow as the country’s demographics shift toward more childless households–less likely than families with children to want detached suburban houses. The power to redirect the nation’s transportation priorities is not found only in the executive branch. To increase funding for public transportation will require Congressional action. Multiple committees in both houses, with their powerful chairs, will have a hand in crafting the Surface Transportation Reauthorization bill. The bill is doubly important because it controls the federal gas tax, which funds transportation; to increase transit funding, Congress will have to increase that gas tax–a hike that has the added benefit of being a disincentive to driving. George W. Bush refused to increase the gasoline tax to keep pace with inflation. So, adjusted for inflation, transportation has been receiving less funding each year. Ideally, Congress will raise the gasoline tax this year as well as open new revenue streams for transportation, since if you fund mass transit sufficiently, driving will eventually decrease and so will gas tax revenues. But the meat grinder of competing interests on the Hill makes the outcome far from certain. One potential roadblock is Montana Senator Max Baucus, who chairs the all-powerful Senate Finance Committee. Baucus, a relatively big business-friendly Democrat from a conservative rural state, may be uninterested in raising the gasoline tax to support a more urban-oriented transportation bill. Public opinion has been shifting toward mass transit, especially with such volatile gas prices. Transit ridership climbed throughout 2008, even though gas prices dropped in the second half of the year. “The public support for greater funds for transit is very clear in the last few elections,” declares Parris Glendening, former governor of Maryland, now president of the Smart Growth Leadership Institute. Initiatives to pay for mass-transit investments have been winning victories across the country, from Seattle to Charlotte. California passed a $10 billion high-speed-rail ballot initiative last year. For the first time, though, there will be a countervailing pressure group. Mass-transit activists have organized a national coalition of environmental, public health, urban planning, architectural and transportation organizations called Transportation for America. Even once unlikely allies such as the National Association of Realtors have joined, since the unmet demand for walkable, transit-oriented living arrangements means that once the transit links get built, there will be money to be made in building and selling condos next to commuter rail stations. There was once a time when the auto-industrial complex had virtually unchecked power on Capitol Hill. Charles Wilson, Eisenhower’s defense secretary, who had previously run General Motors, infamously declared in his confirmation hearing that there could be no situation where he would be forced to make a decision adverse to GM because “what’s good for the country is good for General Motors, and vice versa.” But this past fall the Big Three automakers faced backlash on the Hill and in the press for their bailout requests. Like their bottom line, their power is clearly on the wane. Last summer profiteering oil corporations had Democrats talking about a windfall-profits tax. If ever there has been a year when the auto-subsidy interests could be defeated, this would be it.